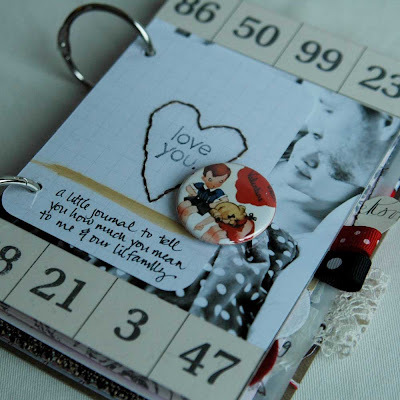 The new love you mini art journal...book cover is made of Hambly Studios heavy clear overlay. 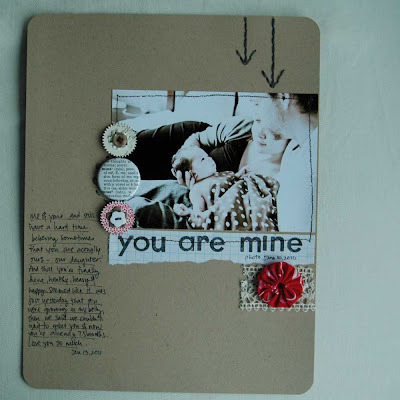 Grid tag is underneath the overlay and features handstitching using stamp set included in kit. 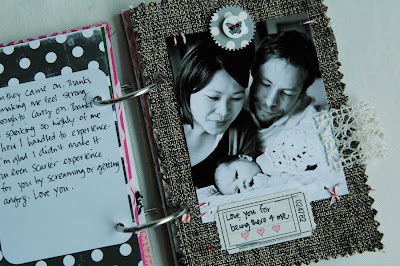 First I stamped the image on scrap paper then I stamped the second image on the grid tag, poked holes with my paper piercer and stitched along the holes. I used only 2 strands of the 6 strand embroidery floss to make it less bulky & give it a cleaner look bc the holes are so close together. 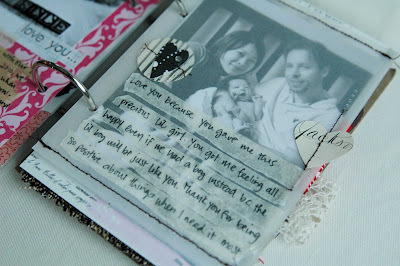 A little vellum envelope to hold a note or a photo. I trimmed my photo and stuck it inside then journaled on masking tape and adhered it to the outside of the envelope. 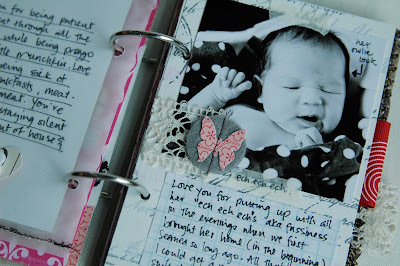 To the left is more journaling that I added directly on the vellum. Just make sure you use a permanent pen like Sharpie or Sakura Microperm or it will smudge! Scrapping on fabric sample piece. I found this fabric doesn't like my adhesive too much so I did some handsewing with baker's twine to make sure it stays put. 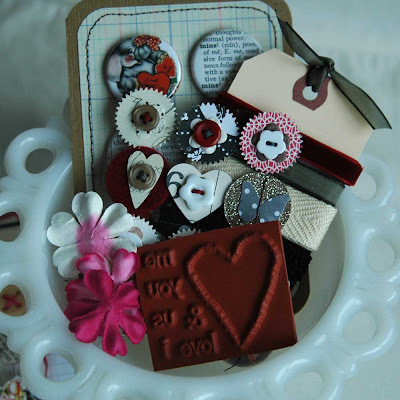 I bought a button maker! 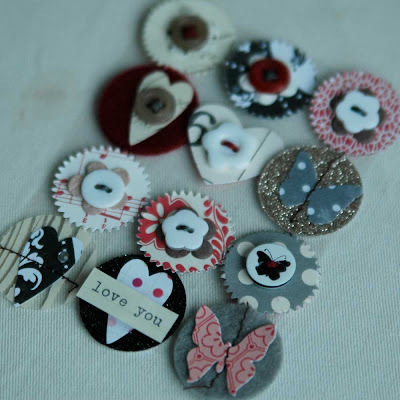 And made these flatback pin buttons:) - see sample project below. 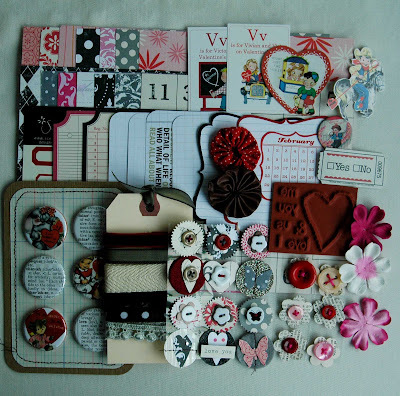 They're 1 1/4" in diameter and feature vintage valentine images and vintage dictionary definitions. These are so neat to use on projects - gives it dimension but still keeps things neat. 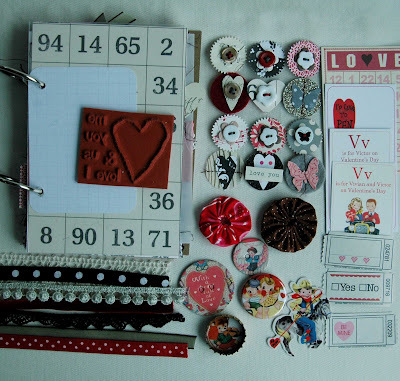 The Valentines embellishment kit:) for those of you who are not into mini albums or art journals but want the embellies. SHIPPING: orders placed Friday & this weekend will ship on Monday. Thank you! 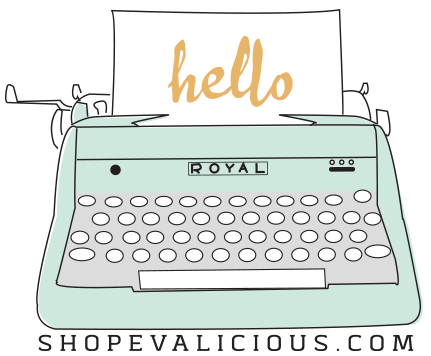 Thank you again for all the nice comments you left on my last post and for your emails:). Hope you have a great weekend! Just placed my order! 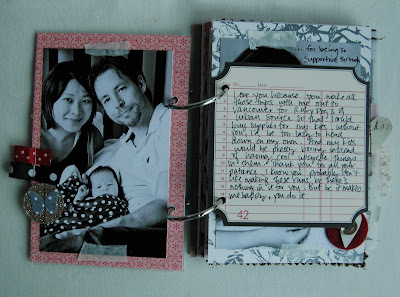 Another fantastic journal, Eve!! Have a lovely weekend! You've done it again Eve, cracking kit. Can't wait to get mine. This is BRILLIANT!!!!!! I LOVE all the photos and what inspiration!!! LOVE LOVE LOVE!